A kitchen is more than just a space for cooking. It is a place that can set your mood for the day over a morning cup of coffee. This is where your family often times gathers for breakfast or dinner. While it is important to think of this space in terms of functionality and practicality, don’t forget about the elements that would make it truly personal. We went through hundreds of kitchen designs on Instagram and selected our favorite ones to serve as your inspiration. Enjoy! The raw bricks gives a more industrial feel to the kitchen, while simultaneously making it more cozy. 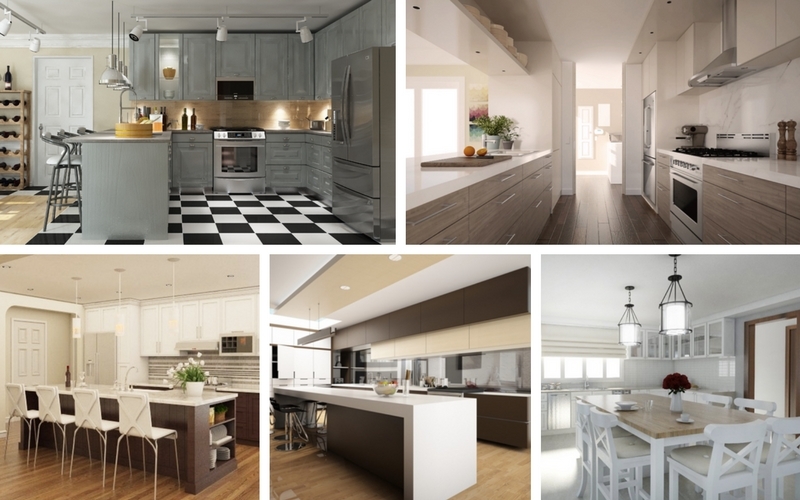 You don’t have to have your entire kitchen painted in the same color of white, grey, beige or light yellow. Have fun, play around with bolder colors to give the space more personality. Why shop for dried cilantro, mint and oregano when you can grow them organic in your own kitchen garden. Not only is it will come in handy when cooking, it is a beautiful bright spot in the design of the kitchen. This kitchen design is so simple, yet it is not boring thanks to teal high chairs. We also love the combination of materials, which create a very neat looking yet homely vibe in this kitchen. You can give your kitchen a country vibe with simply the right selection of tiles. We absolutely love these ones – they brighten up the space, giving it a more personal touch. There is so much we love about this design, from the giant fork on the wall to teal accent colors in elements of the decor to lego-inspired cabinets. High ceilings can give your kitchen a completely different look if you have the option of playing with natural light. Also, what a great blend of different design styles! These elements can truly personalize your space. So whether you create them yourself, spend a few hours at the flea market or purchase them from a designer shop – definitely pay attention to the accessories. These giant lights over the dining table make this space look chic and modern. Who said you can’t have your library in the kitchen? After all, kitchen is used by so many people as simply a place to pour wine after a long day at work. You know what goes well with wine? Books! This space beautifully combines simplicity in materials and colors in the upper half of the kitchen, and bold colors and strong designs in the lower half. You really have to be creative to make small space feel larger and not constrained by various elements of design. From bold colors to unique accessories, don’t feel limited in your options. On the other hand, if you have an open floor plan with lots of space, don’t feel the need to fill it up with as many items as possible. Embrace the uncluttered space. Instead of hiding your dishes, make them a part of your interior design. It is a splash of chaos perfectly balanced out by the structure created through symmetrical stripes and limited colors. You can either stick to the simple elegance of minimalism or really commit to exaggeration. The results will be stunning either way.